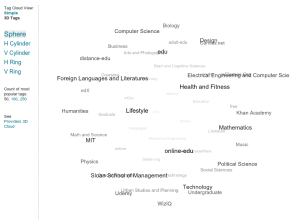 There are thousands of MOOC courses available now. If you want to learn something just find a course, enroll and study it. But what if your aim is to get education level equivalent to a college degree and you want to use MOOC? You need to have some pathway through many courses. And it is real problem . MOOC providers didn’t offer education pathways or curriculum. There are few offers, but only for selected specialty like Computer Programming. However, there are no curriculum for cases if you want to study courses from different providers. This is natural to use different MOOC providers as one subject can be better explained in a course from Coursera and another subject is better to study with a course from edX. MyEducationPath.com created a tool called Path Builder. It is aimed to help competent people to build curriculum with MOOC courses and share it for community. So, if you are the professional in some subject, if you familiar with higher education process and curriculum creation then you can help the MOOC community. Use the tool Path builder to create a curriculum on your subject and share it with the community in the Path directory. The tool allows to create curriculum (“education path”) from more than 10,000 courses from our MOOC list. Are you competent to create curriculum? If Yes, try it now. 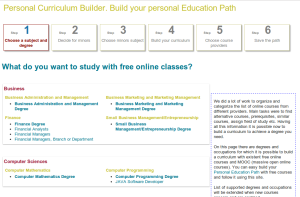 Plan your education “manually” with the tool “My Education Path” where you search best courses for you and add to your scheduler. Get one of prepared paths from the Paths directory. This is the directory where our users share curriculum created by them with all other users of the site. Just find the degree you need and apply the path to your scheduler. 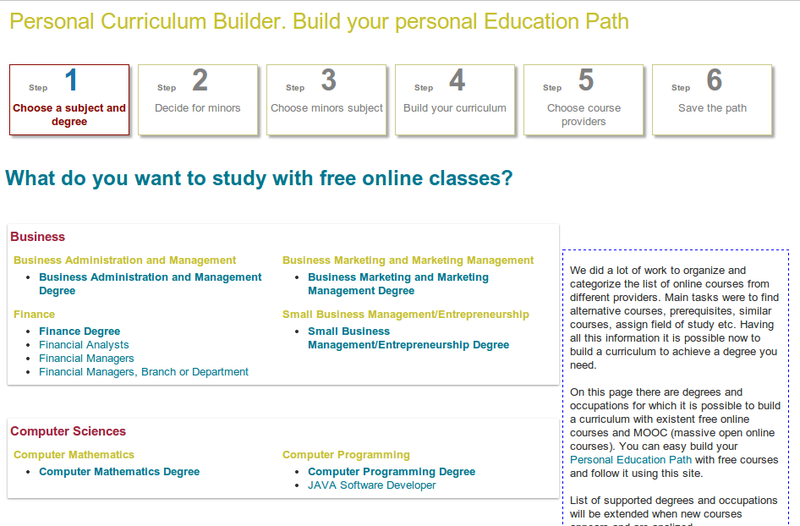 And now we are ready to announce new way to plan your personal education path – the “Dynamic education path builder”. This tools is under testing at the moment. It runs in the beta mode. We offer our users to try it before the final launch. The idea of the tool is to help a student to create personal curriculum to achieve selected degree. 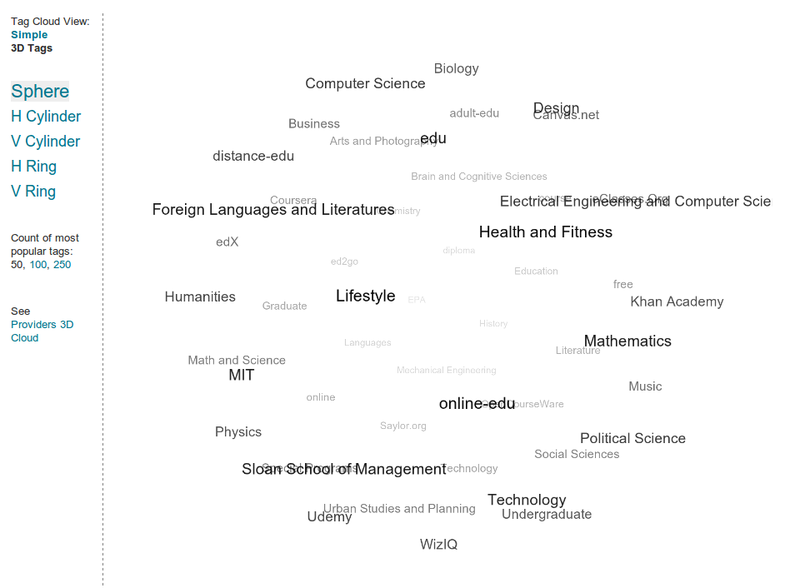 We did a lot of work to organize and categorize the list of online courses and MOOCs from different providers. Main tasks were to find alternative courses, prerequisites, similar courses, assign field of study and other relationships between courses. Having all this information it is possible now to build a curriculum to achieve a degree you need. The tool allows to include only specified subject courses ( majors ) in a curriculum or add also some common subjects courses (minors). Save the path to your personal plan and start your education! Remember, this works in beta mode. And we wait on your feedback! Let us know if you have any questions or comments. The plugin “MyEducationPath” for LMS Moodle (moodle.org) was extended and new version released. The plugin now can be used to generate certificates of course completion in the LMS Moodle. Getting a feedback from students about a course in form of comment and rating. The plugin can be downloaded on the special page – MyEducationPath Moodle plugin . This software is built with using the API. Read more about Certificate generating with MyEducationPath.com. We continue experimenting with ways to search MOOCs by our users. Today we launch brand new tool – MOOC Tags Cloud. There are 2 views for this tool – flat tags cloud and 3D tags cloud. We expect this tool must become popular. If you like it then share with your social networks with your friends! And, as a bonus! We created nice 3d MOOC Providers Cloud. It is amazing, isn’t it! MOOC Calendar. New approach in MOOCs aggregation. For last two years many MOOC aggregators appeared. All of them are just flat list of courses. Only some of them allow filtering and search. We also have the list of MOOCs and online courses (which is biggest, by the way). However, we decided to create something new. Some new interface to search courses more intuitively. This is why we created MOOC Calendar. On our opinion, calendar view is best for such cases. More then half of online courses, especially MOOCs, have start date defined. alendar view is the best for such courses finding.